I need to take a moment and just say that I think all of you are amazing. Your creativity and desire to help others is just absolutely fantastic, and I thank you for it and know other readers really appreciate the time you take to share your experiences. In this case, a number of you responded after I published a post on the difficulties one reader was having with her cat’s diapers. Here are some of the tips and tricks that were shared. I hope they help! Natalie: I use size 1 human diapers, meant for newborns, and cut a tail hole that is flat under the tail (like an isosceles triangle △), and pull up the back until it’s snug under the tail. Then when I do up the tabs, I make sure both are very tight, and I pull them over as far as they will go, which in Dimity’s case is all the way to the other hip for the first tab, and all they way around to the back for the second. Then I pull up the leg holes (which do have elastic in them), so Dimity is comfortable and has freedom of movement. Because the diaper is tight around her waist, she is not able to wiggle out of them (and she slithers into some very tight places) and I have not had any trouble with leakage of anything. And she’s had some pretty bad diarrhea at times, and pees a lot. I think it’s all in the technique. Don’t worry about the waist being too tight — the way the diapers are constructed, it’s not really possible. Dimity flops around sometimes, too, and she has never flopped out of a diaper. 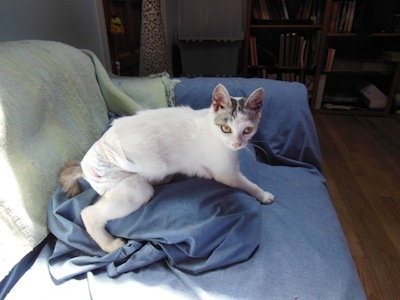 Ms. Phoebe: A few of my Facebook friends or their sibs have had to wear diapers and struggled too. One such family that has used diapers is my kit Willow, her Mom used them with her sister Eliana. I believe she found a place she could get ones that hospitals used on preemies. Mew can private Willow or her Mama Wendy on her Facebook page. Another resource I would suggest contacting is Best Friends Sanctuary in Utah. They have an entire unit, Quincy’s House, devoted to cats with special needs and many who are incontinent. Wendy, Willow’s Mom, found them to be a helpful resource. Tenth Life Cat Rescue in St. Louis is another pawesome resource in that they help special needs kitties. One of their foster moms, Bobbi Hale, is currently looking after a paralyzed kitten named Sinatra who wears diapers. He has something he wears over them called ‘fancy pants’, which have cool patterns on them. I’m sure if mew asked they could put mew in touch with her and see what ideas she has. I believe she expresses his bladder a few times a day too to help minimize his urinating in a diaper. One final resource I know of is Tabby’s Place in NJ. They are a sanctuary for special needs cats like Baby Dot who recently was adopted. She has spina bifida and is incontinent. They have many techniques and methods they use and I’m certain would be happy to advise mew. Can you share any diaper tips or best practices? If so, please leave them in the comments or feel free to contact me! Thanks! I don’t have any diaper tips but have so much respect for all the pet parents who have to clean up their CH cats, or any special needs pet, or that are awesome enough to take the time to diaper these little ones!! Mimosa has always been “skilled” enough to go in her litter box without problem. She would rather topple out of the box headfirst before daring to step in her “business.” However, the other day she had a little upset stomach and took a misstep and I had my first experience trying to clean her up after the litter box. Neither of us were very happy about it – least of all her. It’s amazing that some people have to do this regularly, even multiple times a day – but I guess I would too if Mimosa needed it! So glad there are so many great people willing to take the time to adopt these little ones, knowing that this messy business may come with the territory! Thanks for sharing, Lauren — and you’re right, it takes a special person to help these special cats! I applaud them — and everyone who shares their live with a special needs cat. They’re extra work, but SO worth it!